With seven games left in the regular season ETSU picks up their 20th win of the season after a 96 to 76 win over Samford. The win extends the Bucs winning streak to 14 and conference record to 11-0. ETSU jumped out to a 30-8 lead in the first half and led 48-35 at halftime and it looked like the Bucs were on their way to a big win. However, Samford started the 2nd half hot and cut the ETSU lead to three points with 15:53 left in the game. 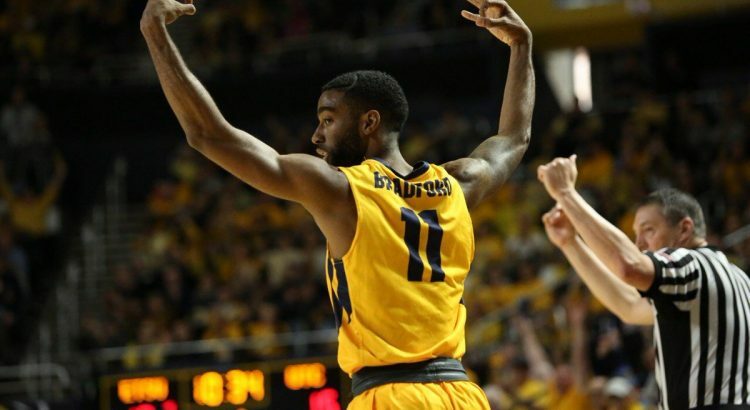 After that ETSU went on a 24-5 run and cruised to the 20 point victory. Desonta Bradford was the star again tonight for the Bucs with a career high of 31 points on 12-16 shooting and 5-9 from the 3-point line. 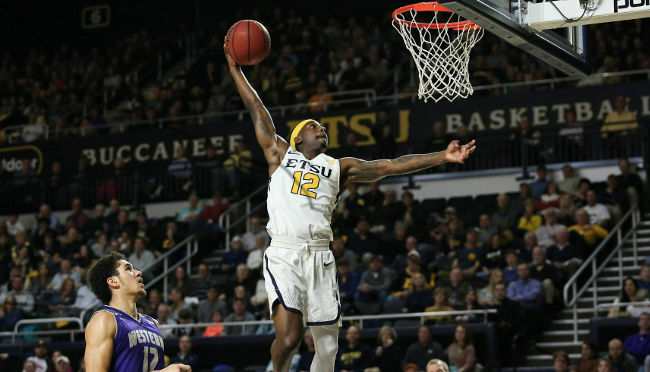 In addition to Bradford, Devontavius Payne added 15 points and Jalan McCloud 11 for ETSU. As a team the Bucs shot 58% and 45% from the 3-point line with 14 total three point shots made. The shooting percentages were a huge improvement over Monday’s night game versus The Citadel when ETSU just shot 36% from the field. ETSU will look to continue their winning streak on Saturday at 4PM as they face off against rival Chattanooga. 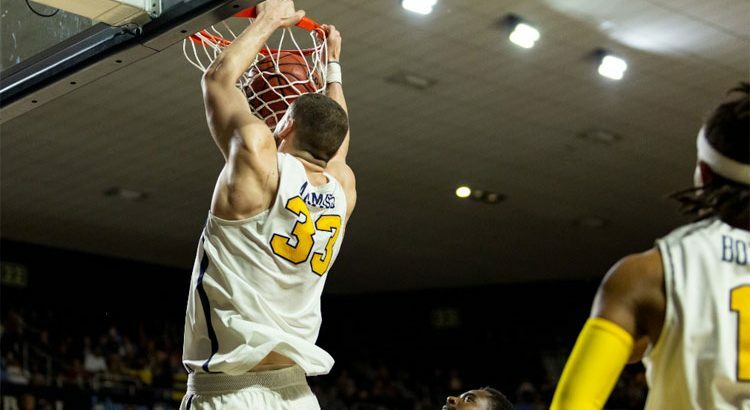 ETSU beat Chattanooga 85-66 earlier in the year on the road. Not only did Desonta Bradford come up big tonight versus Samford but his impressive play earned him player of the week in the Socon. Bradford averaged 18.3 points, 7.7 rebounds and 4.3 assists per game to help the Bucs to a 3-0 record. Bradford is the 2nd ETSU player to earn Socon player of the week this year. Senior, Peter Jurkin also earned player of the week honors on January 9th. For the third year in a row ETSU basketball has reached 20 wins, however what’s most impressive is it’s February 1st with seven games left. 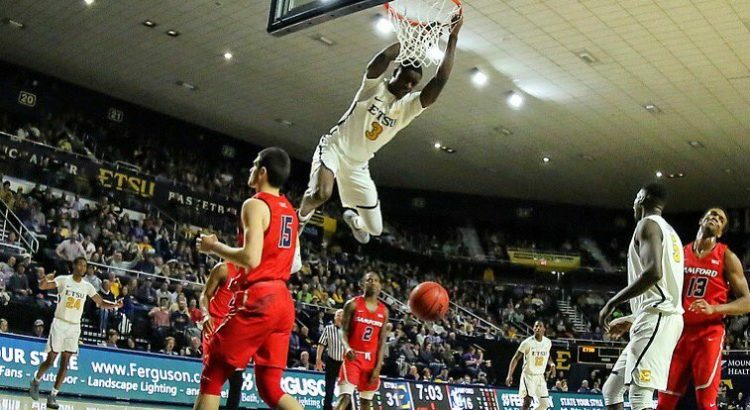 This is the fastest any ETSU team in history has won it’s 20th game. Not only that, but currently only 8 other division 1 college basketball teams have 20 wins. Some of those teams include Villanova, Auburn, Virginia and Purdue. 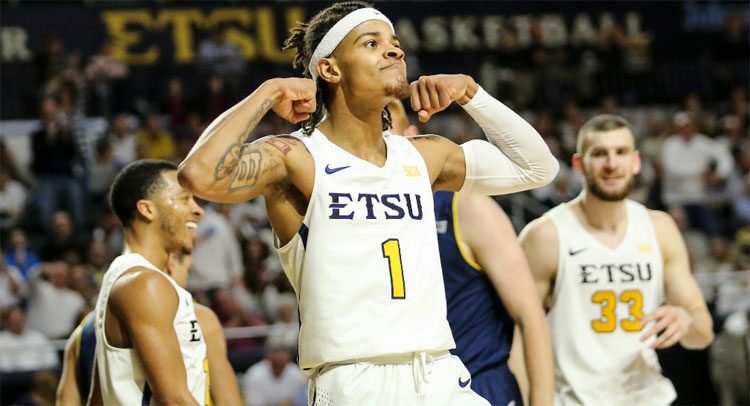 ETSU came into Spartanburg, SC as winners of 11 in a row and Wofford, who had only lost one game at home all year, was looking to end the winning streak. 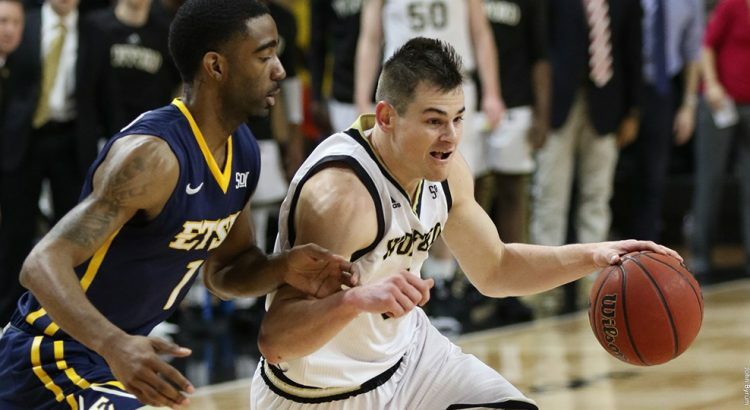 Despite a hard fought effort and energetic crowd at the new Jerry Richardson Indoor Stadium, Wofford was unable to derail the Bucs. Thanks to 17 points from Desonta Bradford and 16 from Jalan McCloud ETSU was able to extend their winning streak to 12 games. The winning streak is now just four games off the school record of 16 which occurred in the 2003-2004 season. The game was back and forth throughout the first half until the 8:54 mark when Bo Hodges made a layup. The Bucs never looked back after that and quickly extended the lead to 9 points with six minutes left. The closest Wofford got after that was four points soon after the start of the 2nd half. Wofford star Fletcher Magee led the Terriers with 21 points and Matthew Peagram scored 10. The ETSU defense continued to dominate as they held Wofford to just 37% shooting and 32% shooting from the 3-point line. Jermaine Long and the rest of the ETSU defense also did their job in containing the Fletcher Magee who was only 6-of-16 from the field and 5-of-12 from 3-point range. Magee never could get going and even missed two free throws. Coming into Saturday’s game Magee had only missed one free throw. There was another streak on the line Saturday that came to an end. That streak actually belonged to Wofford. The Terriers had won five straight versus ETSU in Spartanburg. Prior to last night the last time ETSU won at Wofford was during the 2002-2003 season. ETSU has a quick turnaround as they travel to face The Citadel Monday evening at 6 p.m. in Charleston, S.C. The Citadel is coming off a big win at Mercer on Saturday and will look to take down the red hot Bucs. Don’t be surprised to see a high scoring game Monday night as The Citadel is one of the highest scoring teams in the nation.